So, you’ve decided to join Pen to Paper. Welcome! We’re glad to have you! We’re a pretty laid back bunch for the most part, but we do have some simple and easy-to-follow rules (guidelines really) for participating in our little cabal. Follow these and we’ll get along just swell. Yes, mostly we just wanted to make this the first rule to be funny, but there is actually something behind it. Remember, even though this is a public group, the work we critique is typically not yet ready for prime time. While some members are less nervous than others about sharing their work-in-progress, many of us don’t want the work we submit to the group discussed outside of the group. There’s a reason we have to meet you before we let you onto our shared Slack site. We can be a paranoid bunch. So in short, don’t go blabbing about other writers’ plot lines or sharing their submissions outside the group without their consent. However, once that work is made available for mass consumption, tell everyone you know! We’re here to help each other out, after all. It’s unfortunate that this has to be said at all, but don’t take advantage of your fellow writers or their time. Our critique group is about mutual benefit. We are not your personal editing crew. We’re all writers, here to better our writing. We rely on each other for honest feedback. Quid pro quo. 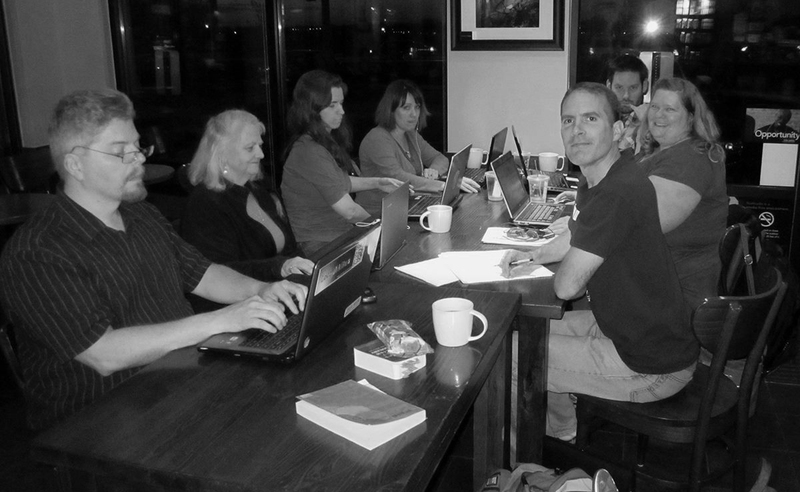 Fair warning: the good folks in your friendly neighborhood writing group can be your best friends or your worst enemies. When group members give up their personal time to read your work and you show up having not read the other submissions, do not participate in the conversation or are out the door right after your work has been critiqued, you will quickly find yourself persona non grata. (That’s two Latin phrases in one rule, so you know we’re freakin’ serious). No, we don’t charge dues, but this ride ain’t free! Just about every religion or social contract includes something akin to the golden rule. Treat others as you expect to be treated. The same goes for Pen to Paper. When we say, don’t be a schmuck, this could easily turn into its own subset of rules, but we’re going to keep it simple. Always critique the writing, not the writer. Try to find something positive and something that could be improved in everything you critique. Yes, you should always be honest, but that doesn’t mean you shouldn’t be courteous. Pen to Paper is comprised of writers of all styles, skill levels, and publishing aspirations. The one thing we all have in common is, we’re here to be better writers. As a member of Pen to Paper, it’s your job to improve as a writer and help your fellow writers accomplish this same goal. He famously said, “I love deadlines. I like the whooshing sound they make as they fly by.” You know what the difference between you and Douglas Adams is? He’s sold a lot of books. So please respect the Pen to Paper deadlines, word count limits, and format preferences. Check out the Newbies Start Here! page for more information. We do occasionally make exceptions to our guidelines, but that’s a privilege you earn with time and toil. Generally speaking, don’t upload a 5,000 word chapter on Saturday afternoon in .schmuck format and expect a critique. Likely it will be missed, ignored or worse. This isn’t a debate, it’s one person’s opinion. When someone takes the time to read your work and give you honest feedback, don’t make them sorry they did it by arguing against their perspective. Sometimes this happens as a knee-jerk reaction, but you need to check your ego at the door if you want to improve. Argue a critique one too many times and you may find yourself staring at blank faces, critiqued only by the chirping of crickets. Members don’t want to critique the guy or gal who makes them feel stupid for stating their opinion of your work. Feel free to ask questions or seek clarification, but in the end if you don’t agree, just thank the person for their critique and move on. Remember, it’s your work. You’re not obligated to take anyone’s suggestion. We ask that you attend at least one critique night before submitting a piece for critique. We get a lot of people who show up and immediately want to submit their work. That’s great, we want to read your stuff, but jeez, you just met us. Don’t you want to make sure we aren’t a bunch of Satanist serial killers first? There is a lot of trust involved in this process on both sides. Come meet the group, see how we interact, and check out our critique format and style. After that, submit until the inkwell runs dry or you publish a bestseller. We’re a diverse, yet tight-knit group and we’d love to have you weave yourself into the fabric of our community (and all that hippy jazz). We’re also not sticks in the mud. You’re welcome to bring your sense of humor, your wit and your insight along with your critiques and conversation. But if you’re coming to the meetings just to spout racist, sexist, homophobic, and/or mad religious/political ravings, then it’s best to just crawl back into whatever hole you came out of and resume writing angry letters to the government. We’re here to write and have a good time. You just finished your story or chapter and you just can’t wait for the group to read it, tell you how great you are, and hoist you onto our shoulders like you just won the World Cup and a full EGOT (that’s an Emmy, Grammy, Oscar, and a Tony award). Well, tap the breaks a bit. If you want us to critique the content, you’ve got make sure we’re not going to get hung up on the typos. Grammatical errors, formatting issues and spelling mistakes take the reader out of the work and force us to play copy editor. We don’t want to play copy editor. Be sure to re-read your work once or twice before submitting to the group for critique. Yes, mistakes happen and you won’t be impaled on a number 2 pencil if you misuse their, when you mean there. But for the love of God, Yahweh, Allah and the Flying Spaghetti Monster, don’t give us a first draft littered with errors, otherwise you’re not only wasting our time, you’re robbing yourself of a more meaningful critique that may actually improve your story. We’re all here to learn and improve, so be sure to take what you learn and apply it one way or another. Ultimately it’s your work and your call whether to take or leave advice, but if the group has to tell you about the same minor or major issues repeatedly, submission after submission, it quickly becomes less than fun for both you and the group. If you submit, show up for your critique, and don’t meander in late. You’ve got a round table of folks willing to give up their time to go through your work with a fine-tooth comb, for free. Don’t blow it! Obviously emergencies and extenuating circumstances happen, but if you’ve submitted, do everything possible to make the meeting. If you absolutely have to miss, then please send a courtesy message via the Slack site as soon as possible. If you submit and don’t show up for your critique, your submission will be removed from the queue. It’s your job to re-submit for critique for a meeting you will attend. We also have a policy that if you re-submit after missing a meeting, you may get bumped if there are other submissions uploaded to the queue. Call it a penalty stroke.